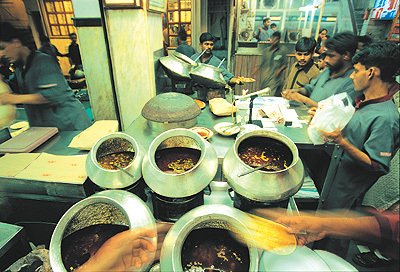 Now if you haven't been to by-lanes of Old Delhi near Jama Masjid to try out non veg, your life as a foodie is incomplete. And hundreds and thousands of Delhiites might have never been there, but I am sure they have heard of it! 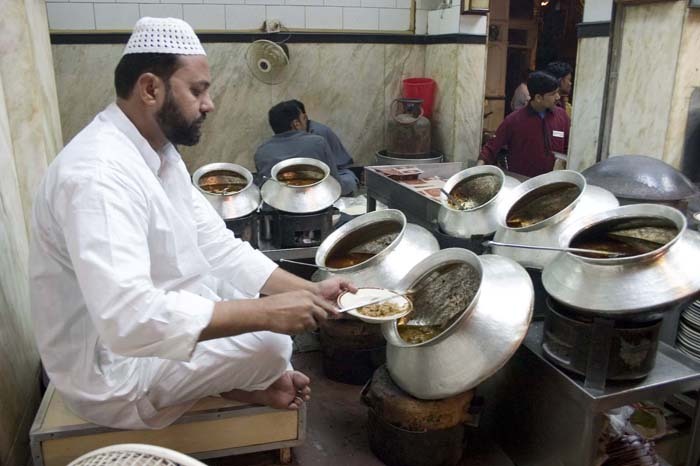 So, even me who had heard about Karim's and food near Jama Masjid for years never went there till only few years ago. It wasn't planned and spontaneous as me and my friend were busy in Car-O-Bar (do I need explain that?). Now, the moment you enter the lane on which you find numerous eateries serving fried and grilled chicken, mutton and fish and also the famous Karim's, you just enter a different world. I remember reaching there at 11 pm and it was so full of hustle bustle it felt like a market at its peak at around 8 pm. Not just the intoxicating and arousing mix of aroma but also the atmosphere that gets you in the mood for a feast! Now that reminds me of we two, searching for Karim's for good 15 minutes and never realized we passed it thrice in our conquest! It so famous and yet hidden in a corner, you actually have to go through a dingy lane to reach there where you will see 5-6 sitting areas! Me and my friend were just laughing at each other! But yeah now that we reached there it was straight to looking at menu. It ain't a fine dining restaurant, its like a normal eatery (it only looks that way) but the food tells that its the real deal and carries a lot of heritage. The recipes as they say are from the times of Mughals! They even make sure they don't cook in steel utensils, its all Aluminium ones with thick base. Now, whenever I go out and eat non veg (its point to be noted that I always eat non veg when I go out), I follow this simple rule, eat chicken if its made by a Punjabi/Sikh and eat mutton is its made by a Muslim. Follow this and you will never let your taste buds down! See the Aluminium Utensils? That's a secret to better cooking! There are few dishes that I would like to suggest and one of them is Badam Pasanda (which I always eat when I go there). The food here is for sure not for the health conscious. Pls leave your healthy hormones at home when you decide to come and eat here! Badam Pasanda is made in pure ghee and the dish will have a thick layer of ghee on top of it. Gravy is very distinct. You will feel the peculiar taste of black pepper. you will see full size almonds in it, for it is named Badam Pasanda. And the meat, so tender, it just comes of the bone so easily. The dish is pure rich! However, if you wanna eat chicken, try chicken stew (pronounced as 'Ishtew'). Its very mild and a bit sweet, you will love it. Now the bread, don't try anything else. Just ask for normal Roti. What you will get is a yellowish colored, fluffy tandoori roti that you will love! 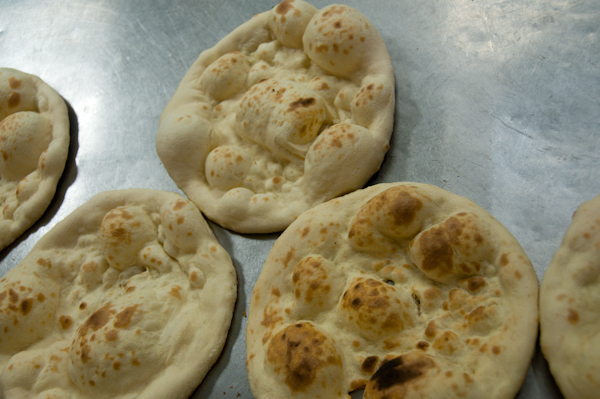 It has more yeast which makes it real soft and tender. Try the Tandoori Raan, but you have to order in advance, takes about 3-4 hours. And then finally there is the big daddy of all dishes, Full roast Lamb (Bakra). You have to order it 24 hours in advance. I have never tried it, but people there swear by it! Well, I tried Badam Pasanda and my friend ordered Chicken Jaehangiri (which I did not like much) and chicken stew. Oh...it was such a treat! I am just waiting for another opportunity to go there and indulge myself into more bites of Badam Pasanda! I asked the cook at Karim's the recipe of Mutton Korma which I have cooked many times over and over at my place. Will share the recipe and experience next time I cook it!